Share the post "Backstage Hero interview with author NEIL DANIELS"
What are you currently up to writing wise? What made you want to write about Metallica and specifically their early years? I’ve actually wanted to do this for a while but it was only recently that I found an interested publisher: Martin Roach at Independent Music Press. I worked with Martin before when he hired me to write a bio of Robert Plant back in 2007. 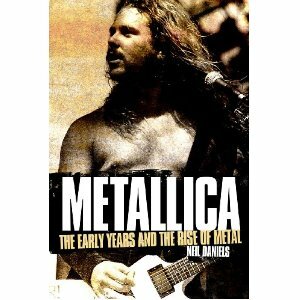 He was really keen on the idea of a book on Metallica. Given that the band’s best work is undoubtedly their first four albums – possibly the fifth in some fans eyes – and that they’ve recently celebrated their 30th Anniversary it seemed like a no brainer. When metal fans talk about Metallica’s best albums they usually mention Kill Em All, Ride The Lightning, Master Of Puppets and Justice. Did you at any time consider approaching band members for an interview; even perhaps ex-band members like Jason Newsted? Sometimes getting the artists involved and their management can convolute the situation and certainly prolong it. All writers are on deadlines too and sometimes there just isn’t the time. I interviewed a few guys that worked with the band or hung out with them a lot during the first three albums: photographer Bill Hale – whose books are Metallica and Megadeth should be in the library of any metalhead – had some cool anecdotes as did my buddy Bob Nalbandian of Shockwaves and Ron Quintana also shed some light on the very beginning of the band. Brian Tatler is another friend and he wrote an excellent foreword for me and also told me some great anecdotes about becoming friends with Metallica. Brian Slagel of Metal Blade Records and Brian Ross of the NWOBHM band Blitzkrieg also gave me some valuable insight. Jess Cox of Tygers Of Pan Tang and Bernard Doe of Metal Forces were also really cool too and gave me some killer stories. When you were researching the book what was the most surprising fact(s) you uncovered about the band’s early days? I’m not sure what the most surprising thing is but certainly there are some very interesting facets about Metallica even during the pre Kill ‘Em All days when Dave Mustaine was in the band. I mean, Lars Ulrich’s sheer determination for Metallica to succeed surely has to be admired even by people that really don’t like the guy. He had a plan/an agenda right from the get-go. His passion for rock and metal and his enthusiasm for playing metal helped make the band what they became and what they are today. I think the first three albums owe a great debt to the late Cliff Burton too. Without him, they would have sounded totally different. Just look at the albums after his death. How do you think the band’s career would have panned out if Dave Mustaine had stayed in the band? I think they would have stayed true to their thrash metal roots. In the 80s they were the kings of the underground metal scene but come 1990/91 and The Black Album they kinda sold out. They were still metal but they were different, more commercial. If Burton had not been killed, they would probably have never made an album as melodic as The Black Album. Which song/album first got you into the band and when did you first see them live? Given my age, I’m a bit of a later comer to Metallica but I’m a huge fan and love their music. I’ve say Ride The Lightning is my fave album of theirs. I also think they’re probably the best live metal band in the world right now – with only Iron Maiden offering stiff competition. You can really argue with how tight, well rehearsed and energetic they are onstage. I don’t always like their setlists but a Metallica shows is always something to remember…for the right reasons. What are your own personal five top Metallica songs and why? ‘For Whom The Bells Toll’ – I’ve always loved this. One of my all time fave Metallica tracks. Great live. ‘Hit The Lights’ – A very cool Diamond Head style metaller. ‘Fight Fire With Fire’ – What more can be said about this? ‘Damage, Inc.’ – Some great guitar work on this one. ‘Seek & Destroy’ – A song that is awesome live; it gets every headbanging and singing. For someone new to the band which album would you recommend they start with and why? To be honest – and it sounds like a lame answer – but I really would start with the first five – not four – but five albums so Kill Em All to Metallica/The Black Album but you can hear how much the band progressed and changed. I do love The Black Album but it doesn’t best represent Metallica the way British Steel doesn’t accurately represent Judas Priest. Why do you think Metallica and the other big three thrash bands (Slayer/Anthrax/Megadeth) became more successful than the whole host of new thrash metal bands around in the 80’s? A combination of timing, luck, the right songs, the right label and a massive amount of touring. Metallica took it to a new level when they signed with Q Prime. Given the poor reaction review and sales wise to their last album ‘Lulu’ do you think they can win back fans and come back stronger? Yes, I think so. I think one reason for being on the road this year and celebrating The Black Album (i.e. their past) is to win back the fans. Metallica are huge worldwide. I suppose it’s good they got it out of their systems with Lulu but I’d really love to see this guys going back to super-quick and sharp three to four minute thrash songs rather than the six minute yawn-fests they’ve subjected to us in the past 20 years. I liked Death Magnetic a lot and the recent EP Beyond Magnetic but they need to be heavier and faster. This entry was posted in INTERVIEWS, Interviews/Backstage Heroes and tagged Metallica, Neil Daniels. Bookmark the permalink.